The industrial plant of Alzamora Carton Packaging in Sant Joan les Fonts (Girona) keeps expanding through the collaboration of Mecalux. A new 15 m high automated clad-rack warehouse will accommodate 1,024 large-sized pallets at this leading packaging sector company. Opened in 2005, the Alzamora Carton Packaging installations in Sant Joan les Fonts (Province of Girona) comprise a high-tech production centre, with independent work areas to ensure dust-free, temperature and humidity-controlled conditions. This new warehouse will be built next to the current facility, featuring: a 26 m high clad-rack warehouse, also built by Mecalux, with a 9,000 pallet capacity, where both raw materials and finished product are stored. This industrial plant is designed, primarily, to produce all types of packaging and cardboard items. From day one, the company has integrated cutting-edge technology into all manufacturing processes, as well as into its storage installations to meet its customer’s demands best. In the last few years, the packaging industry has undergone a complete makeover and has adapted to the consumer behaviours of a new generation of customers. Alzamora Carton Packaging was able to analyse the market in the interest of providing better products and services, which helped make it one of the leading businesses in the sector Europe-wide. With a bright future ahead of it, and to deal with this business growth, the firm confidently chose the technical team at Mecalux for the best logistics solution. Mecalux will build another automated clad-rack warehouse as an annex to the already erected warehouse. 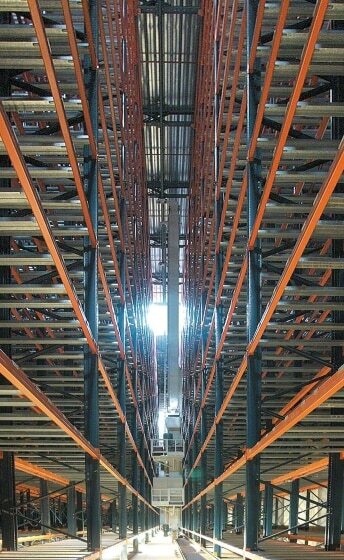 It comprises a single 65 m long aisle with double-depth racks running down both sides. The warehouse installation will make full use of the available area to have the storage capacity needed to supply Alzamora Carton Packaging’s customers. A conveyor circuit will be enabled at one end of the aisle that will include a checkpoint and an empty pallet stacker. Operations at this warehouse will be fully automated, meaning the company will reap the benefits of better-secured goods, lowering the risks errors may spawn and strengthening customer care. Back in 1900, Pere Alzamora founded a small printing-press service in the town of Olot (Girona). Almost 120 years later, it has become one of the leading companies in the European packaging sector. This transformation is the fruit of the company continually improving all its processes, pushing its competitiveness to the next level.